TICKETS: $25/$20 for students and senior citizens with an ID. 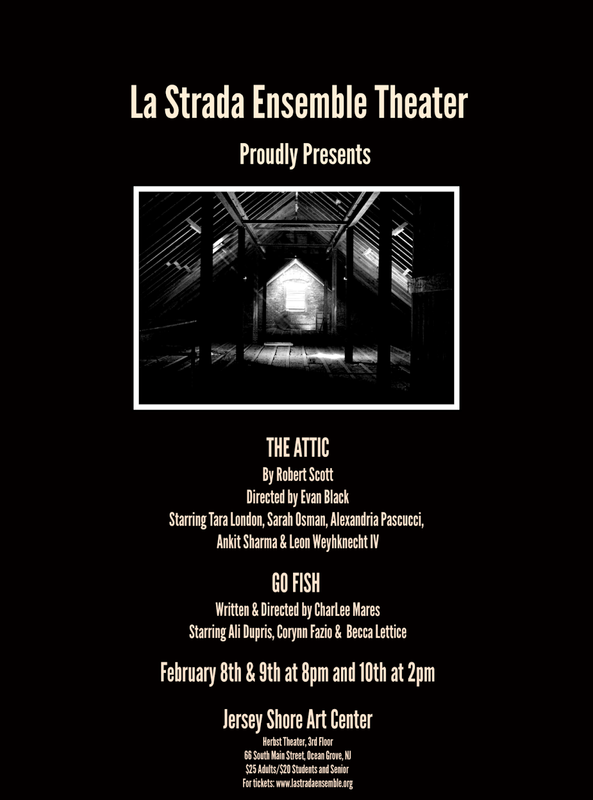 For tickets and information, please visit us online at www.lastradaensemble.org or by emailing lastradaensembletheater@gmail.com or calling (732) 455-2748. La Strada Theatre Ensemble is one of New Jersey’s premiere developmental theatre companies that brings together theatre artists from the tri-state area with playwrights from throughout the United States. THE ATTIC and GO FISH make a double bill of mysteries. In founding member and British resident Robert Scott's NJ Premiere of THE ATTIC, Demi began sorting out the attic, but she’s become obsessed with a letter she’s found. Is it a suicide note? A confession? What is her connection with the woman from the past? In the world premiere of NJ resident CharLee Mares' GO FISH a card game unlocks the mystery of a murder. The evening stars Ali Dupris, Corynn Fazio, Becca Lettice, Tara London, Sarah Osman, Alexandria Pascucci Ankit Sharma & Leon Weyhknecht IV.